Taking out more -1/-1 counter producers sounds like a bad idea especially one that produces so many. I'd cut Dowsing Dagger Flip though but I'm not sure about cutting it for Trinisphere . If you wanna Faerie Macabre dagger would be the thing to cut. I don't think it's as necessary now that you have Gaea's Cradle. Inkmoth: Thanks for the comment! Honestly, I've found Archfiend of Ifnir surprisingly good, mostly because he can be cycled if unneeded (and reanimated post-cycling if you need him back). 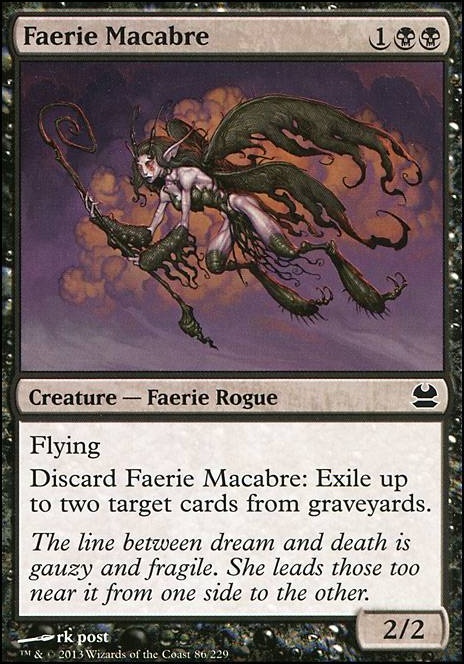 Faerie Macabre , because the idea is discard it (that is great for Hollow One and Living End ), and then you may exile cards of an opponent's graveyard. I suggest you to add it to the main, because in the actual metagame there are many decks that use the graveyard or important graveyard-cards like IzzetPhoenix or Dredge. Ingot Chewer in the sideboard, against artifact decks the idea is cast it by it's Evoke cost, and then you may use it with Living End . I suggest Faerie Macabre for some graveyard hate. Plus, she is a Faerie (of course!) and a Rogue. @killroy726, FormerBalloon, The problem with cards like Tormod's Crypt , Relic of Progenitus , and Nihil Spellbomb is both deck strategies can easily bypass these. 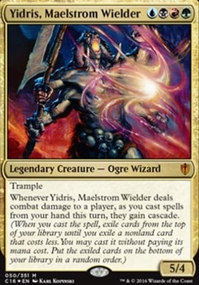 Flash-Hulk can easily tutor out a Grand Abolisher which shuts down their abilities entirely, and Gitrog can always discard another land, or put a draw trigger on the stack to save their Dakmor Salvage just to resume the combo all over again. 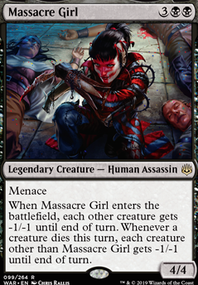 @xaarvaxus, The Walking Ballista combo has been removed in order to run these hate cards, but I still note it in case if there are better cards that won't interfere with it. I did run Darksteel Mutation , but the Gitrog player would just start playing their full combo in one turn which bypasses the sorcery speed of Darksteel Mutation . To better effect I simply ran Nevermore naming The Gitrog Monster , but Nevermore would become awkward in games where The Gitrog Monster wasn't present, as Nevermore 's hate effect can really get a particular player to start hating you fast. Instead of Darkblast I run Molten Vortex as it's repeatable effect can bypass counterspells which is very helpful against counter-heavy decks that want to win through Laboratory Maniac , Azami, Lady of Scrolls , Arcum Dagsson and Edric, Spymaster of Trest . I've ran Barbarian Ring , Cabal Pit , and Scavenger Grounds , but the flux of graveyard hate easily kills threshold and holding up 2 mana and the Scavenger Grounds is a real pain. I'm on the fence about Faerie Macabre as the graveyard-hate effect feels too narrow against other decks. I might be more inclined to run Ghost-Lit Raider , but holding up 4-mana doesn't make it any better either. Leyline of the Void also feels gimmicky as a 1-of in a 100-card deck, as both combos can easily out-race me in playing it if it's not in my opening hand. I would prefer running Planar Void instead, but that card would ruin my Wayward Servant + Gravecrawler combo.